COTABATO CITY – The Aboitiz-owned Cotabato Light and Power Company (Cotabato Light) and the local government of Cotabato formed a project that will help prevent fire, electric pilferage and to make village officials as trained and certified electricians. “Tatsulok” (triangle) refers to three groups that composed the project – Cotabato Light, Cotabato City government and the “Liga ng mga Barangay” (Association of Village chairpersons). Nataño said “Tatsulok” aims to address at least three areas that concern public safety to prevent fire, prevent pilferage and to improve the firm’s services to its clients. She said the firm needs the general public through the village officials in preventing pilferage and promote energy conservation. 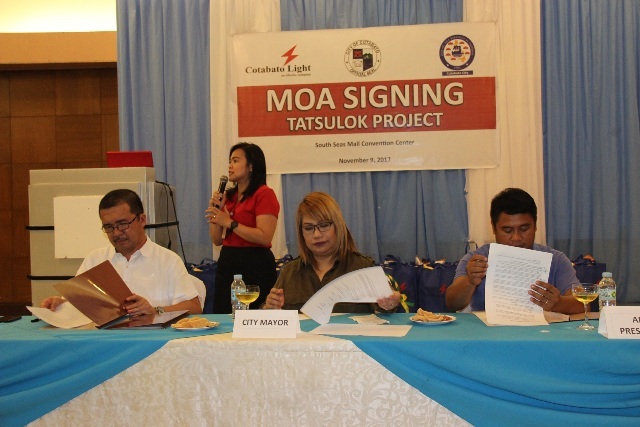 “Communities and pedestrians are at risk of fire and electrocution when there are illegal connections,” said Nataño after the Nov. 9 signing of Memorandum of Agreement (MOA) between Cotabato Light Assistant Vice President and General Manager Judy C. Sanchez, Mayor Frances Cynthia Guiani-Sayadi and 37 village chairpersons of Cotabato City at SouthSeas Mall convention center. “Electricity pilferage is against the law,” Sanchez said, referring to Republic Act No. 7832 or (An Act Penalizing the pilferage of electricity and theft of electric power transmission lines/materials, rationalizing system losses by phasing out pilferage losses). “Countering electricity pilferage is everyone’s responsibility (and) Cotabato Light cannot do it alone, we need the LGU and Barangay officials,” Sanchez added. “Tatsulok” has supporting programs that will benefit both the program proponent and the beneficiaries. Under the “Kasangga program,” the Barangay government will endorse two potential electricians to be trained by TESDA for 15 days, targeting National Certificate (NC II) licensed after schooling. Another “Tatsulok” supporting program is “Oplan PBA” (Punong Barangay Awards), a Cotabato Light program to recognize Punong Barangay advocating anti-pilferage in his or her constituents. To be recipient of “Oplan PBA,” there must be zero-pilferage case in his area of jurisdiction and must be consistent for at least six months. Cotabato Light will also declare a village “Pilferage-free” after choosing the chairperson as Oplan PBA awardee. To avail of this supporting program, the village chair should be an “Oplan PBA” awardee to qualify. The village chair has the privilege to choose from his constituents potential scholars to study with TESDA as electricians. Cotabato Light will shoulder the cost, provides allowance and complete set of tools for the trade. Added to all these are other community development projects that the Aboitiz firm will introduce in collaboration with partners. For her part, Mayor Sayadi posted on her FB page the city government is determined to continue eradicating illegal acts in the city, especially pilferage or illegal tapping (of electricity) that causes fire and conflagration. “We signed a MOA with Cotabato Light to help eradicate pilferage and unnecessary power interruption due to illegal tapping,” Sayadi said in Filipino. She said under the project, the city government and the barangay government will help monitor and prevent illegal connections in their respective locality. “I would like to remind Cotabatenios that like monetary thief, illegal electrical connections are another form of thief,” she stressed. Beside, Sayadi said, illegal electrical connections could trigger fire in residential areas that may result to loss of lives and properties. “So, let us all help prevent pilferage. Altogether, we jointly fight all forms of criminality and illegal electric connections in Cotabato City so we continue to grow and develop as a city,” Sayadi said. The project commenced after the MOA signing.